As contractors and visitors sign into reception, traditionally they would sign a reception guest book. Modern technologies digitise this process with the Work Sign app. Digitally capture who has signed into the reception area, capturing their details, photo, emergency contact and even conduct a short site induction with a safety policy or procedure acknowledgement. Empower your site with emergency contact lists, communication tools to alert everyone who is on site of an evacuation or emergency, track who is currently on site right now and record full sign in history. 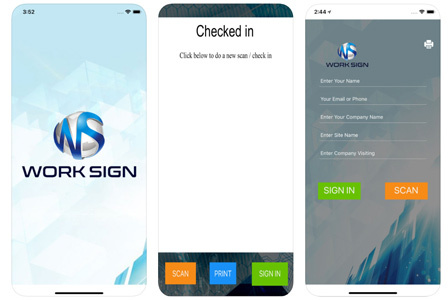 Set up a touch screen, tablet and stand connected to a wireless printer for site sign in at reception or site entry. Visitor or Contractor walks up to reception, self checks in using sign in tablet. Bring the WOW factor to your sign in process. A slick and easy sign in process for your reception, transforming the archiac visitor sign in book into a modern self managed sign in system. No need to issue stickers for a simple delivery but you still want to track who is delivering what and to whom? No problems, full delivery management as part of the sign in platform. Create sites, setup rules, workflows, forms, policies and other specific requirements unique to your workplace easily and quickly. You have control for your workplace. For contractors who arrive at reception, cross check their insurances, certifications and evidence of training. Ensure they are inducted, that their company is fully compliant, prevent non compliant contractors from entering on site. Be alerted to contractor arrivals and track who is on site now.